Donald Trump is our C student in chief. 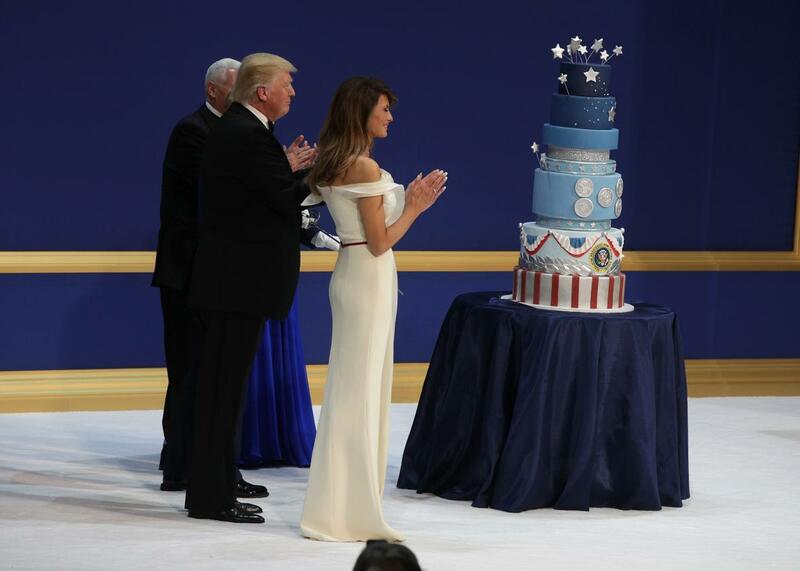 President Donald Trump and first lady Melania Trump, along with Vice President Mike Pence and Karen Pence, clap before cutting the infamous copy-cat cake during the inaugural ball at the National Building Museum on Jan. 20 in Washington. Eight years later, Ipcar and his former colleagues are less proud than dismayed. Trump’s administration has preserved the shell of the site while gutting it from within. Rather than construct a new template, the Trump administration focused on removing pages about LGBTQ rights, criminal justice reform, health care policy, and climate change. Trump’s web wizards also temporarily disappeared the judiciary branch from the portal’s Government section. Trump’s online embodiment isn’t just a bad website. It’s a microcosm of this administration’s laziness, sloppiness, and lack of imagination. This is Donald Trump’s life story: He helps himself to the fruits of other people’s labor, even as he denigrates those he’s cribbing from. As a businessman, he stiffed his contractors; NPR recently reported that three Washington-area companies are suing Trump International Hotel for more than $5 million in unpaid fees. The executive order draft that caused a stir last week when it appeared to revive Bush-era detention and interrogation policies almost exactly mirrors a campaign proposal from Mitt Romney’s camp. Sure, political documents often draw on language from past officeholders. But placed in the context of this president’s mulish mediocrity, the cloned order feels like yet another example of our C student in chief copying someone else’s homework. It’s telling who is and isn’t allowed to get away with stealing other people’s work. When CNN discovered that conservative commentator Monica Crowley, whom Trump had tapped to direct strategic communications for the National Security Council, was a serial plagiarist, the White House at first defended her. “HarperCollins—one of the largest and most respected publishers in the world—published her book which has become a national best-seller,” the Trumpkins team trumpeted, invoking the POTUS-friendly metrics of ratings, sales, and prestige. “Any attempt to discredit Monica is nothing more than a politically motivated attack that seeks to distract from the real issues facing this country.” But Crowley pulled herself out of consideration for the White House post soon after. Apparently she hadn’t quite mastered—or been permitted to exhibit—her leader’s shamelessness. Or consider the tango that ensued when viewers realized that Melania Trump had airlifted into her RNC address sentences from her predecessor’s remarks at the 2008 Democratic convention. First, Paul Manafort and Sean Spicer vociferously denied that any literary theft had occurred. (Spicer memorably quoted a few gauzy lines on family and dreams from the My Little Pony character Twilight Sparkle before demanding, “Did Mrs. Obama plagiarize her, too?”) Then, as media outlets turned up the heat, Trump Organization employee Meredith McIver stepped forward to take the fall. She released a statement flagellating herself for including some choice phrasings Melania had highlighted for her. “This was my mistake, and I feel terrible for the chaos I have caused Melania and the Trumps, as well as to Mrs. Obama,” McIver said. The apology never acknowledged that Melania would likely have noticed the Obama language she’d so admired when it reappeared on her own teleprompter. Plagiarism is about impunity, and impunity means that when you can’t erase the consequences of your actions, you need to find someone else to absorb the punishment. Trump, for his part, showed no remorse about lightly shaming his wife, along with the media, about the speech debacle. At the Al Smith Dinner on Oct. 20, he lamented that Michelle Obama’s oratory earned rave reviews from the biased press while Melania said the exact same things and “people got on her case.” The soon-to-be-president’s laugh line got a big round of applause. The man, it must be said, can take a joke: He’d lifted his quip, almost word for word, from a cartoon that appeared in Roll Call.